His father, Adolfo, worker in the shoe industry, as an amateur flutist he played in quartets which dug tango in vicinity. Two elder brothers played the violin: Adolfo Salvador Vicente (Fito) and Alberto Roque, the latter was more involved than the former and was linked to music for several years. It was his father who taught him his first music lessons, he started his first steps with violin too, but soon he switched to piano, although it took don Adolfo a certain time to buy the expensive instrument. After being trained at Conservatories nearby, at fifteen he started professionally at the Café de La Chancha, so called by the customers in allusion to the lack of hygiene of the owner. 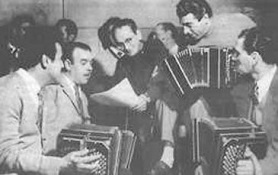 Sometime later, then at a known café in downtown Buenos Aires, he took part in the group of the first female bandoneonist in tango, Paquita Bernardo. Going on with his career, Osvaldo entered Enrique Pollet quartet, later he played in the famous Roberto Firpo orchestra, and in 1927 he was pianist in the great bandoneonist Pedro Maffia’s orchestra. He together with the violinist Elvino Vardaro left it to form a group under their name which we know was avant-garde for the time, but it has not left recordings. Vardaro-Pugliese had their debut at the café Nacional, to engage in a long tour across the country. They were accompanied by the poet Eduardo Moreno, as manager and Malena de Toledo, as female singer after Moreno’s suggestion. Moreno was the lyricist of “Recuerdo”, the most successful tango composed by Pugliese. Continue reading.